"Every day is another challenge, because customers are always coming up with new demands. And those customers come from everywhere. For example, I have already been able to build a machine in France. That's how to get around and at the same time do interesting work! What else would I want?" Are you looking for a partner who can put your ideas and/or questions into innovative solutions that adds value to your process or product? Then you are at the right place at Orangeworks. 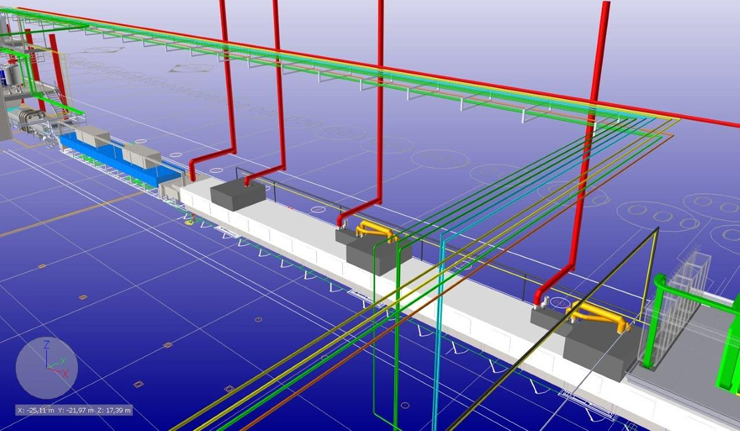 We offer engineering solutions using the latest 3D design and drawing software. Concept Engineering: based on your specifications, we make a conceptual design. 3D scanning: using a special 3D laser scanner and software, we can visualize your complete factory in 3D and use this scan when designing a new layout of modification to an existing line. Layout engineering: designing a production line to measure in a new or existing building (green & brownfield). Line engineering: integrating machines and equipment from different suppliers into a total solution. Process engineering: compiling and managing P & IDs. Mechanical engineering: converting a draft design into a technical design. Detail engineering: making detailed drawings required for production.